If you’re looking for a side gig that gets you out of the house, food delivery services are popping up everywhere. Every time someone clicks “deliver,” a driver (or biker) goes into action — picking up the food and delivering it to the customer FAST! 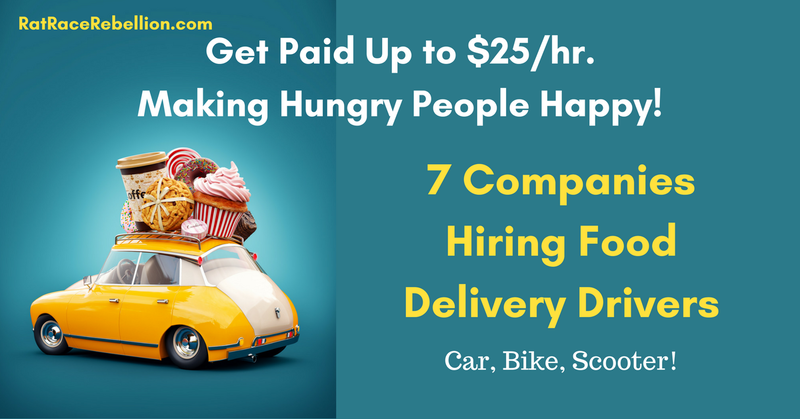 Following is a list of seven companies that post job listings for food delivery people! If you are courteous, quick, and available, apply today with the services in your area! This is an independent contractor position – choose when you want to work. Being very familiar with your iPhone or Android is key to this job. Dashers reportedly make up to $25/hr. Hourly pay varies widely, depending on such factors as the metro area, whether “surge” and “boost” rates are in effect, how you manage your orders, and tips. Almost any vehicle OK – less strict than regular Uber. Pay every Thursday by direct deposit to your bank account. Work when you want; the service runs 24/7. Competitive compensation packages, tips, and mileage reimbursement ($0.54/mile). Drivers are paid once a week via direct deposit (for work from the prior week). Drivers earn a commission on the delivery fee we charge consumers, plus 100% of tips. Fast start – many of our drivers are on the road in as little as 7-14 days. Earn up to $25+/hr. on your own schedule. Own a bike, car, truck, scooter or motorcycle; have a valid driver’s license and an upbeat attitude. For more jobs like these, check our Newest Jobs & Gigs page. To be the first to hear about jobs like these, like our Facebook page. May you be working soon! This entry was posted in Earn Extra Cash and tagged delivery. Bookmark the permalink.